Back in February, a video clip of a brand new Sony product became an internet must-see. Within hours of its original upload, it became the toast of Twitter, was embedded in endless blogs and was earnestly discussed by some of the technology industry's biggest hitters. Witty, well produced and entirely unofficial, for a brief period of time it made Sony the most talked-about brand on the entire internet – something that the company's previous attempts at viral marketing had tried hard to do but conspicuously failed to achieve. There was just one problem with all of this. The clip was called 'Sony releases new stupid piece of s*** that doesn't f***ing work', and it was a parody made by satirical news website The Onion. As Sony has discovered, viral marketing is the A-bomb of advertising: powerful, dangerous and something you really don't want used against you. Viral marketing is all about buzz – that is, getting people to talk about your product or service. If you get it right, the rewards can be enormous: Hotmail came from nowhere to become the world's favourite web-based email service, low-budget indie film The Blair Witch Project became a blockbuster and Cadbury's relaunch of Wispa generated masses of publicity. These products may have used different techniques, but they all embraced viral marketing. Viral marketing is all about harnessing the power of network effects, the phenomenon where one person on the internet tells their friends about something, and those friends tell their friends, and their friends tell their friends, and so on. In the case of Hotmail, the service simply attached a message to the footer of every outgoing message, turning each user into a Hotmail evangelist. The Blair Witch Project used a website to convince people that it was a documentary about a real mystery, making its visitors tell other people about the film. And then there's Wispa. The return of the Wispa is a classic example of canny viral marketing in action. In 2007, 93 Facebook groups spontaneously appeared, with 14,000 people passionately demanding the return of the chocolate bar. When Iggy Pop played Glastonbury, crazed chocolate addicts stormed the stage with 'Bring back the Wispa' banners. We're paraphrasing, but you get the idea. It's a shame no agency took credit for the campaign, because it's an excellent example of how to get viral marketing right. Another excellent example of effective viral marketing is Dove's Evolution, which demonstrates through video how the models used for advertising are digitally 'enhanced', creating unrealistic expectations of what women should look like. 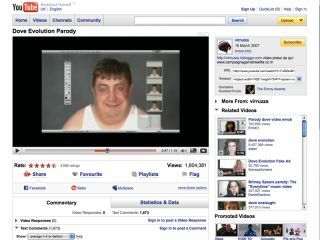 It's so popular that even YouTube parodies of the clip have become huge hits; one such parody, which takes a male model and turns him into a slob through the magic of lager, fast food and cigarettes, has racked up nearly two million views on the site. Viral marketing doesn't always work, however. When General Motors wanted to promote the Chevy Tahoe 4x4 in 2006, it asked people to make their own adverts online – which they did, creating endless videos suggesting that the car was ideal for environmental hooligans. The campaign was quickly canned. One of our favourite disasters, though, was Sony's fake blog promoting the PlayStation Portable. Its hilariously see-through attempts at being, ahem, 'down with the kids' earned it worldwide mockery.